never have my birthday wishes been simpler. So people ask me what I've been busy with. meet tenma, a bouncing 9 and a half kilo baby boy with two very cute dimples and huge eyes. i played mommy for all of two nights when i met his mom for dinner, but really, raising a kid in japan is a whole load of trouble. wakko's now based in tokyo, and because her husband works crazy hours she finds herself alone with tenma most of the time. last week she upped and escaped to okinawa for a short break when childraising proved too stressful. 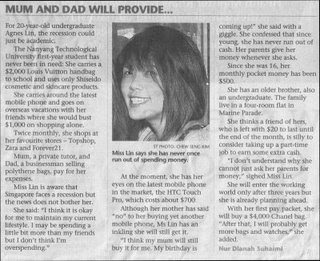 maybe it's because my friends in singapore are still mostly single, but i really havent seen a mother as devoted as she is. makes me wonder what kind of mother i might turn out to be. the plus side of being a mother? beautifully sculpted biceps from carrying a baby as heavy as two sacks of rice all day, not to mention hoisting a baby bag and pram up and down the stairs of tokyo's mommy-unfriendly train stations. And so the boy turned 29.
one of his friends who was guest spinning at an event decided to turn the gig into a birthday party, and there was even a homemade birthday cake, which reminded me of how M&M graciously turned up with lovingly made cakes two years in a row when ken was in singapore. more than how ken's good frends rallied to throw him a party, ken's birthday made me very happy because almost everyone present had a piece of good news to share. sam completed his master's and is finally working towards his doctorate. nishime, yuuki's boyfriend and ken's closest buddy, has decided to enter politics and run in his native ward. elections are up next february and yuuki tells me that if he gets elected they will finally be able to move in together. the couple have been dating for six years and honestly, i havent met a couple more infatuated with each other so i really hope nishime makes it work this time. itching to chip in, i volunteered to help out in the campaign so maybe i might end up standing by the street corner waving to motorists during the election. ryota is headed to tokyo by next year to fulfill his ambition of becoming a dealer, and he tells me he actually tried to get his foot in the door by buying stocks of an oil company he was keen to work for. that boy eventually got called up for an interview. takenori is gaining weight from a seemingly blissful new relationship and now even his smiles look and feel a lot different. now just about every singaporean with access to internet knows exactly how silly you really are. of course your comments have been misquoted and taken out of context by the sunday times, but then again, boo hoo. stupidity really knows no bounds.